THE TRUTH: ISLAM IS COMING TO EUROPE AND THE UNITED STATES OF AMERICA AND THIS IS WHAT HAPPENS TO THOSE WHO DO NOT WANT TO CONVERT. Muslim Act Of Mercy Rather Than Torture A Twelve Year Old Boy. There is nothing wrong with being a Muslim because Barak Obama says the future must not belong to those who slander the prophet of Islam. ISLAM IS COMING TO EUROPE AND THE UNITED STATES OF AMERICA AND THIS IS WHAT HAPPENS TO THOSE WHO DO NOT WANT TO CONVERT. Muslim Act Of Mercy Rather Than Torture A Twelve Year Old Boy. There is nothing wrong with being a Muslim because Barak Obama says the future must not belong to those who slander the prophet of Islam. One of the fighters shouts ‘Allahu Akbar’ meaning ‘God is great’ after taking a small knife to the boy’s throat and cutting off his head in the Palesinian refugee Handarat Camp in Northern Aleppo. The child, who is clearly under the age of 12, was arrested by the Islamist militants for allegedly being Palestinian Liwaa Al Quds, al-Quds Brigade fighter, according to Russia News Now. One of them holds him by the hair and slaps him in the face. Judging by his ragged clothes and the marks on his arms, it appears the boy was impoverished and may have been tortured before he was murdered in the video, seen by MailOnline. 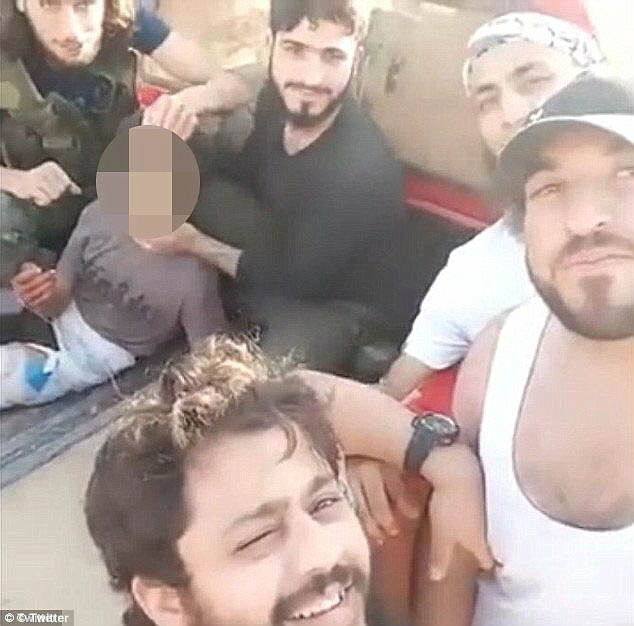 The boy is placed face-down in the back of the truck with his arms tied behind his back when the executioner is handed a small knife by a fellow fighter. He then cuts the boy’s throat before shouting ‘Allahu Akbar’ and holds his head aloft. 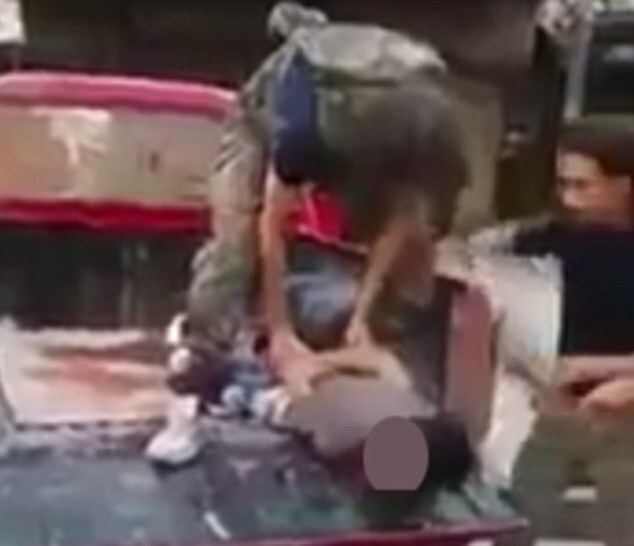 Before the video ends, he places the head on the boy’s back before jumping down from the SUV. Liwaa Al Quds is a pro-Syrian government Palestinian paramilitary faction made up of the Palestinians who have been driven out of their homes in the Handarat Camp once Islamist militants took over the neighbourhood. Today, the group is fighting alongside the Syrian Army to retake the camp. Nour al-Din al-Zenki is part of the Levant Front, and its allies the Islamic Front and the Free Syrian Army are fighting to overthrow the Assad regime. It is also battling ISIS and the U.S government supplied the group with money and anti-tank missiles. WHO ARE NOUR AL-DIN AL-ZENKI? Harakat Nour al-Din al-Zenki is an Islamist rebel group in Syria formed in late 2011 during the Syrian Civil War. In December 2014, it joined the Levant Front and also the Fatah Halab operations room. YOUNG BOYS' LIVES MATTER. All lives matter. God will judge those who abuse. Those who hate the truth will run, except where will the sinner man go. Death has the last say in this world. In the next world, your eternal destiny depends on what you have done in this world. Repent now and ask God to forgive you, then persist in sin no more and mercy will be shown to you. Reject your opportunity to receive mercy now and you will suffer the fate of your own hand for eternity.